Choose your friends wisely. This is one of the greatest decisions you can make in your life. 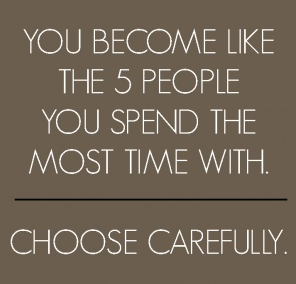 As this great share on Pinterest reminds us, we become just like the people we associate with. Their habits and their actions rub off and we find ourselves doing and saying things we never previously have done. Find friends who help you do good. Don't let your friends tear you down and persuade you to do wrong and make mistakes. Think about your friends and the people you spend the most time with. Are they good? Are they destroying your personality? Are they someone you want to become?